"It's not that hard to make your own kielbasa! The best part is that you get to see exactly what goes inside. Boil or grill them before serving." In a large bowl, combine pork, beef and garlic. In a separate bowl, stir together black pepper, salt, brown sugar, ground allspice, marjoram and liquid smoke. Combine mixtures and knead with hands to combine. Fill casings with meat mixture and refrigerate overnight. Boil or grill before serving. A well-balanced meal using kielbasa in a fresh way. Pshaw! My husband and his whole family are Polish and they said these reminded them of home. I liked them too, and I can hardly find Poland on the map(ha). Thanks for the recipe. If you're looking for real Polish food, this isn't it. This is an awesome recipe, I prefer to add more liquid some then calls for. Also, using the large casings, making a good sizes link, I only get about half of what is stated. I nixed the liquid smoke. I cooked it a bit too long on the grill but it still tasted great. I froze the raw sausages and they really are perfect to have on hand. We have a smoker, and we are going to try to smoke it in there. :) Should come out alright. 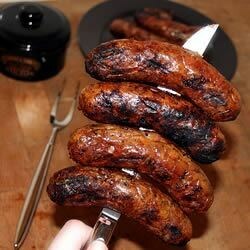 Just a tip, I never ever boil my sausages, you will loose a ton of flavor.